Watch Dogs 2 is the latest installment of the popular action adventure video game franchise from Ubisoft. In the role of Marcus Holloway, you need to join the hacker group "DedSec" to shutdown the system that unfairly accused you of a crime you didn’t commit. 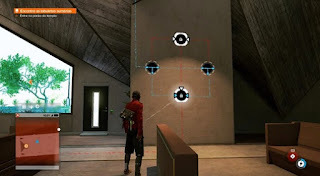 Among the various challenges of the game, there is a puzzle that takes the player from the serious: communication or power circuits. In them, it is necessary to send the signal from one end to another to achieve a certain goal, such as sending signal, power-up etc. Check out how to solve the puzzle. Basically, to solve the puzzle, you have to get the energy to the end point. In other words, make the entire route be composed of the blue line to its key point. At the beginning of the adventure, just turn the light plates so that the blue light is taken to the paths that are in red. However, as the game progresses, the difficulty increases. You will start to find some panels with padlocks. To unlock them, you must direct the blue light exactly to the points they unlock. For example, if behind the padlock symbol appear paths on the left and right, you need to get the light to reach these two points in order to be able to move. At many times you will also need to use cameras to be able to view and access higher panels. Always remember that the puzzle only ends when you send the blue light to the end point and trigger the same.